Members will surely be saddened to learn of the death last Friday, at the age of 89, of BRDC Honorary Member Maria Teresa de Filippis at her home in Bergamo. She had been seriously ill for some time. Although other women, notably ‘Helle-Nice’ and Elizabeth Junek, had made a considerable impression in Grand Prix racing, and road racing generally, in the 1920s and ‘30s, Maria Teresa’s place in motor racing history is secure as the first woman to take part in a Formula 1 World Championship race. In 1958 she drove her own Maserati 250F to 10th place in the Belgian Grand Prix on her first visit to the full length Spa-Francorchamps road circuit. This was not Maria Teresa’s first Formula 1 race for she had made her debut in the 250F a few weeks earlier in the non-championship Gran Premio di Siracusa, finishing fifth. Maria Teresa contested two more World Championship Grands Prix in 1958, the Portuguese at Oporto and the Italian at Monza. In Portugal, after crashing her own car she borrowed the 250F of Gerino Gerini but retired with mechanical problems. However, back in her own car for Monza, she was running fifth when engine failure brought about retirement with less than 14 of the 70 laps remaining. Had the Maserati’s engine held together just a little longer not only would Maria Teresa have been remembered as the first woman to drive in a World Championship Grand Prix but also the first to score points. 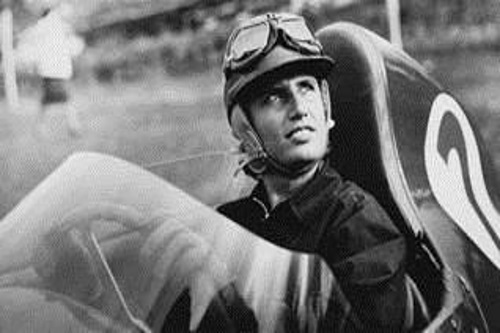 The Syracuse race had been won by the factory Ferrari Dino 246 of Italian hero Luigi Musso, whom Maria Teresa had first met in her early years in racing and who had mentored her career. Tragically Luigi was killed a couple of months later in the French Grand Prix at Reims. Jean Behra then took Maria Teresa under his wing, giving her the chance to drive his F2 Porsche Special in the 1959 Monaco Grand Prix. However, as in 1958 with the 250F, Maria Teresa was unable to qualify for a place among the 16 permitted starters. A week before Monaco, Maria Teresa drove in her last race, the Daily Express International Trophy at Silverstone from which she retired her Jo Bonnier-entered 250F with transmission failure. For the second time in Maria Teresa’s racing life tragedy struck when Jean Behra, shortly after falling out with Ferrari, was killed at the AVUS driving a Porsche RSK in a race supporting the German Grand Prix. Over the years the focus has tended to be on Maria Teresa’s single seater races which has tended to gloss over her not inconsiderable achievements from 1948 in saloons and sports cars. With her Fiat 500 she won her class first time out in the Salerno-Cava dei Tirreni hillclimb. Further success with the ‘Topolino’ led to a Urania sports car powered by a 750 cc BMW motor cycle engine, followed for 1951 by a Giannini-Giaur Spider and continuing success in the 750 cc class. In 1954 an 1100 cc OSCA MT4 brought more success including a class win and 4th overall in the 1954 12 Ore di Pescara and 2nd overall at Sassari and Posillipo. A Maserati A6GCS replaced the OSCA with which Maria Teresa contested the 1955 Mille Miglia, Giro di Sicilia, Sei Ore Notturna di Bari (5th overall), 10 Ore Notturna di Messina (3rd overall), the Targa Florio (9th overall) and won the Catania-Etna hillclimb outright, all of which gained her second place in the 1955 Italian 2-litre Sports Car Championship. Following the death of Jean Behra, Maria Teresa turned her back on motor racing until 1979 when she was invited to join the Club International des Anciens Pilotes de Grand Prix F1 (now re-named the Formula 1 Grand Prix Drivers’ Club). She became the Club’s Secretary-General, then Vice President and ultimately Honorary President, playing a very energetic role in the Club’s activities. Since 2002 Theo, her husband of over 40 years, has been the Club’s Secretary-General. To him and to her family and many friends the BRDC offers its sincere condolences.